Spark your interest in science through interactive exhibits and activities. Themed zones such as Flight and Space, Built Environment and The Innovation Lab will allow you to explore various science topics. Plethora of exhibits geared specifically to 3-4 year old pre-school students such as Animal Kingdom Fun and Fun in Motion. 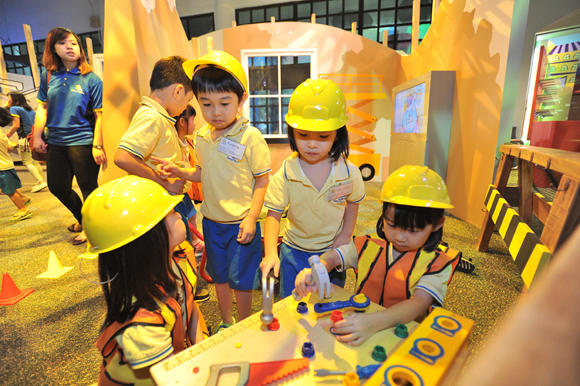 Several exhibits tailor made for 5-6 year old students such as Sky Explorer and Job Express. Great destination for a pre-school or kindergarten field trip. Please present your iVenture Card or voucher at the Singapore Science Centre ticketing counter for your entry. Collection Information Please present your iVenture Card or voucher at the Singapore Science Centre ticketing counter for your entry. Science play booking is inclusive of 45 minutes facilitated programme and 1hr 15 minutes free play time. Using creative drama and hands-on activities to communicate and teach science to young children, programmes are structured around concepts based on the different zones at Kids STOP. It is their aim to make learning positive, enjoyable and impactful for young children and to inspire continuous engagement with science through activities such as interactive story-telling, role play, puppetry, games, experiments and demonstrations. Go Bananas: Go bananas is a dynamic programme designed specially for children aged 3-4 years old. Children’s knowledge about fruits will be enhanced through this multi-sensory lesson. Each child will acquire scientific skills such as observing, predicting, classifying and sorting. They will learn about colours, shapes and sizes as well as taste through a fun and exciting journey! Sky Explorer! – Space and Flight:Sky Explorer! is a fun-filled flight programme designed for kids aged 5- 6. Children will learn about living things that fly as well as different types of man-made flight machines. Children will create simple flight machines and put them to test in the Space and Flight zone’s powerful wind tubes. These are just two examples of the exhibits on offer that can help develop the learning capacity of children aged 3-6.